We traveled down to Kent this past Saturday evening for a visit to their annual Kent fireman's carnival. My days of riding on spinning rides may be gone, but a delicious pulled-pork sandwich and an order of onion rings at a friendly carnival, supporting our neighboring towns volunteer fire company, now that I can still do! I also tried my luck at the cake booth, but met with no success. The white elephant tent had some bargains left, and we did come home with a cute blue teapot. I was thinking about playing some Bingo, but Dr. Kissinger, Kent's famous homeowner and his wife were holding court, so I stayed clear of the gawkers, and hey, I might have been lucky, and beat him, and I could just see the headlines....Sharon wine shop owner takes down the former Secretary of State....wouldn't look good. Kent's Carnival is one of the last in the area, and in my mind, is one of the best. Next year, give it try and see if you agree. Plus, on the last night, which was Saturday, we saw a great fireworks display @ 9:30pm. Very cool! LRP....a really big BIG member of the community! OK, I know this is probably not high on the list of many of you as a thing you think about, or may have ever thought about, but let me pose a question to all of you. Back a few years ago, when the whole Sharon Hospital transition was in its earliest stages, we were all having conversations like, what would Sharon do, or be, without Sharon Hospital. Remember those days? Well, thankfully the knight on the white horse (Essent) rode in and well, bought the hospital. So the, what if it had gone away, is not in our forefront thoughts, at least for the foreseeable future. Skip to the point where I want to go with this blog entry..........Can you imagine things around here without Lime Rock Race Track? Seriously. Ever think about it? Give it two minutes out of your busy day, and think about the effect it would have to probably most every single town in our area. And I have not even mentioned the employees of the track, from ticket sellers, ticket takers, office people, maintenance, grounds, electricians, sign companies, on and on. A big part of the community, that I bet many of us take for granted. And I haven't even mentioned Skip Barber yet. Many employees. Much equipment, which all needs attention. Thank God for Lime Rock Race Track. A valued partner of our community. Amazing. Loud cars, going like the devil, in a controlled environment. Supporting a community. I hope Lime Rock Track lives on forever, for we all depend upon it..
My Aunt Mabel would say, "Saint's Preserve Us!" The vote was loud and clear. There was no mistaking the pulse of those attending. The majority want their roads fixed. They're tired of the patches getting patched. They're tired of the wear and tear it has put on our vehicles for years, not to mention our own minds. I admit it. I have down-right cussed our roads at times. I know that what they do will not be perfect, but it will me so much better. And if they indeed follow thru, and establish a timely, regimented maintenance schedule of them following this project, then, and only then, will this truly be a great thing. If they build them, and then never touch them again in 10 years, then they will have done nothing but spend a lot of money and fail to get the real bang-for-their buck. I publicly say thank you to Bob and his supporters who worked very hard I am sure, in a relatively short-time, to bring this project to a vote. Bob spoke to this matter in his campaigning last year, and give him credit, he has followed through on his promise. How the townsfolk's decided was beyond his control. But he did as he said he would do. In all honesty, I was never convinced that others thought as I did, but last night proved me wrong. Or, did it actually prove me right? Only time will tell. Step A and Step B are complete. Lets hope Step C goes as well. Soon end to a dead-end road? 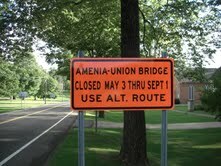 If the sign is right, then the bridge over the Webutuck Creek will be re-opening next Wednesday, or so. And thus will come to an end the stillness and quiet that living on a dead-end road brings. Amenia Union Road in Sharon and The South Amenia Road in Amenia will again be roads that allow someone to get from here to there. Traffic will pick-up. Quietness will disappear. Dust. Racing motors. The calmness will drastically change I can only imagine, particularly on certain days and certain times. The casual strolls are probably sure to disappear as well. This coming Friday, the 27th, there will be a special town meeting to consider a proposal being brought by the selectmen to take on a bond and really repair correctly many of the roads. Key words here....repair correctly. I am as dutch as my ancestors, and spending my money I want to be a wise thing. Anyone who travels our town roads knows the urgency that we have to do something about our roads. The condition of many of them is, well, almost edges on deplorable. For too many years, our town fathers have done nothing but patch patches and where there has been pavement applied, it has been a bang-for-your-buck cold mix. Looks good for about three years, then it's falling apart. And then the patching starts again. Our town is made up of a few major components: its people. Its school. Its town hall and property holdings (ie: beach, green, community hall, fire company) and its system of roads. Those I think of as its major parts. Each must be maintained, and of course that brings a cost. We try to be frugal when and where we can, but for too many years our roads have fallen victim to being almost last on the list, or so it sure seems. Its like we never want to fix anything right in Sharon in regards to roads. We settle for mediocrity. Oh, they are ok seems to have been the answer forever. Well, we felt the same for years at the school, and we finally bit the bullet and started at the foundation and worked from there up, and we built a good school building. And we are maintaining it. And we all have pride in it, or should have. We need to do the same with our roads. We need drainage work. We need new culverts. We need to get water to run off of roads, meaning edges need to be cut back and graded, allowing water to run off, not just run on and pool up at low spots. We need base (the foundation) in areas where there is none. We need to do it right, and we need to maintain it after we do it, not just do it once. I have met with our first selectman on numerous times discussing the matter, and he assures me that if this vote goes thru positively, that roads will be built, not just repaired. 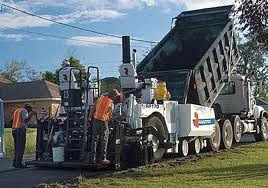 We won't just put hot asphalt on instead of the cold, cheap mix and nothing more. If that is the case. then I recommend we all vote favorably this Friday and start getting one of our assets into shape. But if these proposals do not face the challenge head-on, and fix the problems at the bottom, then vote no and tell the selectmen to get it right. It's our town. We all need to own it and take pride in it. Roads, and the condition of them is a part of it, and we all should be concerned. I hope to see you and your friends there Friday evening, at our town hall. "must be in Sharon, look at the roads"
Not sure if all of you know but there is one great bed-and-breakfast that opened last year, very quietly, here in Sharon. Bel Meadow B & B is right off Williams Road, at number 17. Owned and operated by Cynthia Conklin, I have heard nothing but outstanding comments on Bel Meadow. The interior is beautifully decorated and the grounds are quite lovely. Reservations for weekends I believe are out quite a ways on the calendar most of the time, so book early. I had the privilege this past Saturday to take a peak at the brand-spanking new and in-service Ambulance which our Ambulance Squad members have been raising funds for years. It was more of a "hey Tom (Tom Alden, Captain of the squad), come on...I need a pic for my blog". Tom was very gracious and gave me a quick pose. It obviously is a very proud time for the members as they get to now use that which they had worked so hard for. Obviously, we are ALL thankful to each and every member of the squad for all that they do for our community. I am sure the ambulance is outfitted with lots of new items to help the squad preform their tasks, be it a rescue situation or a simple transport from the home to a doctors office for those who might need an assist. The ambulance was on display most of Saturday morning, and I bet will be again. If given the opportunity, take a look and tour at the new "rig". If an ambulance can be beautiful, I'd say this one sure is that. Oh, and keep those donations going in. Supplies, training. It never stops. But thats ok.
~the pile grew by just like ten-fold over night, so couldn't help myself with one more pic. Sorry to be a day late. My keyboard at home tried to drink some wine and well, it found it didn't like it (nor did I--wait till I see THAT salesman! )...so, I just picked up a new one this morning. Back in business. (I wonder if dishwashing soap boxes and bottles will now be saying safe for PC and Mac keyboards? One of the things that I felt was really wise by The Choe's in their re-doing of the SFM was how they evaluated everything there, and decided what they could clean and repair and paint, and what they needed to get rid of. In today's society it is so easy to just throw-away and buy new. Well, The Choe's are being good folks of our planet, and fixing and re-using many things. Signage is one. These aisle signs are the old ones, just rebuilt, varnished given a new look and being re-used. There are department signs which came from a store in New York state that was less than two years old and went belly-up. I would imagine that the Choe's were able to save considerable on start-up costs with things they fixed themselves or acquired from the closed store. Very smart......very smart. Caught up with Chris and his helpers moving in two granite (I'm guessing), extremely heavy pieces on Wednesday. No, they aren't for a ball-toss at a carnival. Nor are they holders for bushel baskets. They are part of the olive display. Apparently, there are many kinds of olives out there in food world (we've never known in Sharon) and Chris and Annie are going to be introducing some to us! How cool is that? I don't want to rush them, not now, but I sure can't wait for them to open! "The horses are at the starting gate......"
I hesitate doing todays post out of respect of Jenn Hansell who is the author of sharonctdailyphoto.blogspot.com, the blog which probably got me started doing mine. Jenn has an incredible eye when a camera is in her hand, and her writing is well, remarkable. I so respect her work, and her as well. A few days back she did a post on the market, and it just is somewhat hard to follow with a similar piece. But I have a few shots that are sort of a series, or might be anyways. It also is a timely posting. Todays carts were all corralled and they just caught my eye this morning. 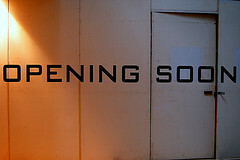 The title for todays post just seemed to fit, what with the new market closing in on a real opening date. I have lots of thoughts about the market, all of which are extremely positive. I'll share a few with the coming days posts. Stay tuned! If you frequent the Sharon Plaza at all during the week days, odds are pretty good you might have seen at one time or another this man and his dog holding office in front of Rick's. The man's name is Karl and his buddy on four feet is "Slugger". Karl is a avid Giant's (NY football) fan and also a great Knicks fan in basketball. If you wanna talk either of those two subjects, check-in with Karl. He'll love it! And if you are more into the little four-legged guy, well Slugger is extremely friendly, and well, quite a ladies man. Karl talks to more women because of that dog! Way you go Slugger! Also wanted to add.....Karl reads the Times, every day, and has for years and years. While his profile may that of down-home ole country boy, Karl is well-read and up on many subjects. Many! Well, I am just about ready to fire up the old DCL, and give it another go. The camera that died has been replaced with a similar model, and quite frankly I have been busy with a home project, a summer vacation and just general every-day stuff. I am thinking perhaps to go full-steam ahead by maybe the end of the week. Maybe I'll do an every-other day to start. We'll have to see. My thanks to those of you who offered cameras and support while I have been absent. I do appreciate your comments and such. So, stay tuned is what I'll say for now! !